6/22 Cup of Coffee: The affiliates took home a 5-3 record saturday, as Portland swept a double header. Lowell and Salem were on opposite sides of blow outs while Greenville fell in extras. The GCL and DSL both managed to score in the ninth to seal their victories. Pawtucket was shut out by the Scranton/Wilkes-Barre RailRiders (NYY), 4-0. Matt Barnes took home his fifth loss of the season, giving up four runs in five innings of work. Barnes surrendered eight hits and a walk while striking out two. Dan Butler picked up two of Pawtucket's six hits, including a double. Christian Vazquez also had a double as part of a 1-for-3 effort. Mookie Betts and Garin Cecchini also collected a hit apiece in the contest. The rehabbing Will Middlebrooks had an 0-for-2 night with two strikeouts. Portland took both games of a doubleheader, dropping the Altoona Curve (PIT) in game one, 5-1. Brian Johnson (pictured, above) was once again brilliant, firing a seven-inning, complete game in which he allowed one run on six hits. Johnson struck out four en route to his sixth win of the season. David Chester and Derrik Gibson each went 2 for 3. Chester added three RBI, thanks to a bases-clearing double in the third. Blake Swihart picked up the final two RBI for Portland on a two-out single in the fifth. The Sea Dogs skirted around a late scare to beat the Curve, 3-2. Robby Scott got the start and pitched well, allowing one run in four innings of work. Michael Olmstead picked up the win in relief, throwing two, no-hit innings. Noe Ramirez took home the save despite allowing a run in the ninth inning. Blake Swihart and Deven Marrero led the charge, combining for four of the team's five hits and all three RBI. 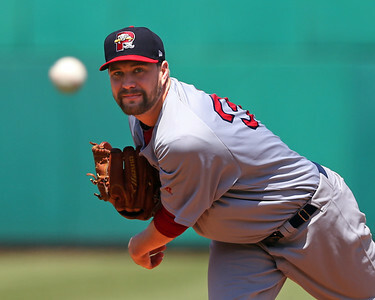 The Salem Red Sox blew out the Winston-Salem Dash (CHW), 13-4, in Joe Gunkel's (pictured) first Carolina League start. Gunkel held the dash to three runs on three hits and two walks while striking out three in 5 1/3 innings pitched. Nate Reed struggled in his 2 2/3 innings, allowing one run on three hits and three walks, though he did strike out five. Dayan Diaz was perfect out of the pen, locking down the final 1 1/3 innings. Every Salem starter was on base at least once in the game. Mike Miller went 3 for 5 with an RBI and a run scored. Matty Johnson, Reed Gragnani and Matt Gedman all has two hits apiece as well. Salem did not score until the fifth, when they brought in six runs, followed by two in the seventh and another five in the eighth. The Greenville Drive lost a heartbreaker to the Savannah Sand Gnats (NYM), falling 7-6 in 11 innings. Trey Ball struggled again, giving up four runs on six hits in four innings pitched while only striking out two. Jonathan Aro did not fare much better as he allowed two runs on six hits in four innings of his own. Taylor Grover was saddled with the loss as one run came across in his three innings of two-hit baseball. There was offense aplenty as the Drive smacked 16 hits in the game. Every starter collected at least one hit on the night. Jake Romanski and Forrestt Allday each collected three hits each and Romanski had one of only three extra-base hits on the evening. Manuel Margot, Kendrick Perkins and Tzu-Wei Lin each had two hits as well. 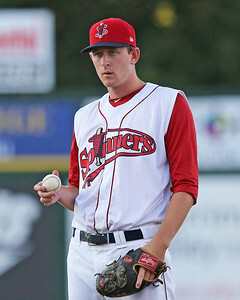 The Lowell Spinners were on the wrong side of a laugher as they fell to the Tri-City ValleyCats (HOU), 11-0. Nothing much went right on either side of the ball as starter Randy Perez lasted only four innings, giving up three runs in the process. First baseman Nick Moore did get to pitch the final inning, allowing three runs (one earned) on two hits and a walk. The Spinners managed only three hits in this one, two of which came off the bat of Mauricio Dubon. The GCL Red Sox scored one in the ninth to beat the GCL Twins, 5-4. Keivin Heras notched the win in relief of Jeffry Fernandez and Pat Goetze. Heras worked his way around three hits in two innings and struck out three to take home the victory. Despite going 0 for 5, Victor Acosta was the hero, driving in the winning run on a ground out in the top half of the ninth. Derek Miller meanwhile took home a 2-for-5 performance. The DSL Red Sox also scored once in the ninth, this time to down the DSL Mets1, 3-2. Ritzi Mendoza got the start and surrendered eight hits, but somehow managed to allowed only one run in five innings of work. Algenis Martinez picked up the win in relief, firing four innings of one-run baseball. The Red Sox managed only three hits in this one, one off of the bat of each of the 7-8-9 batters. Player of the Night: Brian Johnson earns these honors with yet another strong performance. The lefty took home his sixth win of the season with a complete game performance against Altoona. Johnson needed 105 pitches for his effort, throwing 72 of them for strike. The 23-year-old lowered his ERA to 1.66 this season for Portland. 1.66 bests even Henry Owens' league leading ERA, though Johnson has pitched in five fewer games than Owens.